The story of Espana all natural grooming products goes back to 1999 and an accident in an indoor arena.Trudy Midas, co-owner of the company with her husband Bob Hansen, was thrown from her horse and broke her back making it impossible to ride again for four years. After three surgeries and years of extensive rehabilitation she was only able to provide daily grooming to maintain the important animal/human bond. During this time Trudy used virtually every grooming product on the market.The harsh chemicals in some made Bob wonder if these ingredients could be harmful to Trudy and/or her horse.The owners of seven race horses and two pleasure horses at the time, Trudy and Bob began investigating better options.Their research indicated that a new all natural equine grooming line would be a welcome addition in the stables. They then set out to develop the line of all natural products that would be effective and safe for humans and animals. This process included consultations with chemists, and additional research and development which led to the inclusion of silk proteins as a key ingredient and to the pleasant signature cucumber-spa fragrance of all Espana SILK products. Finally, in 2006, the husband and wife team found an experienced, quality manufacturer to produce their all natural line of grooming products. 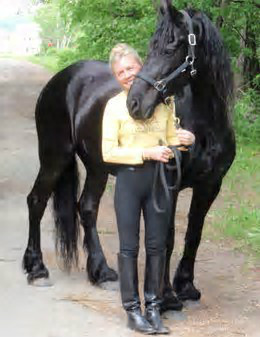 The result of Trudy's extensive equine grooming experience is a line of products that the couple believes is the most enviromentally superior and safest on the market.And,fortunately,Trudy is now happily riding her prized Friesian horse,Isabelle.